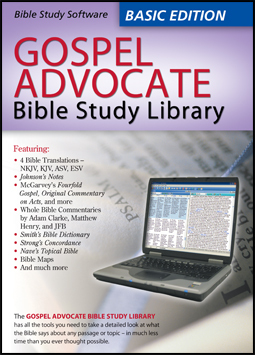 For a limited time (through 10/30/2013), Gospel Advocate Bible Study Library – Basic Edition is available from the Gospel Advocate online store for only $12.99 (Reg $19.99). Simply enter the promo code (P003) at checkout to receive this special offer (applies to first 50 redemptions). The Gospel Advocate Bible Study Library has all the tools you need to take a detailed look at what the Bible says about any passage or topic – in much less time than you ever thoughts possible. With this easy-to-master tool, you’ll be able to dig deeper than ever before into God’s Word. Click HERE for more information on what is included in the Basic Edition CD-ROM.